This houseboat in Venice Marina, LA is situated on the main dock (no dragging all your stuff in carts down the dock- drive right up to the front door!) 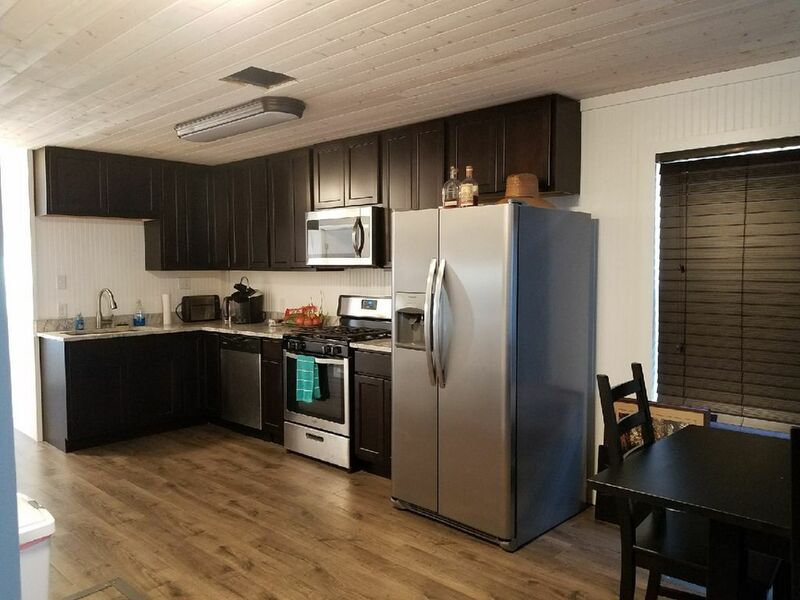 We recently purchased the houseboat and have fully renovated the inside - new floors, kitchen, kitchen appliances and bathroom. Includes a washer and dryer and ice machine for your use during your stay. The back of the houseboat is accessible by boat and has a slip to park your boat. Fish skinning table is on the back deck. Inside the houseboat is two bedrooms, one with two sets of bunk beds (total of 4 beds); second room has one bunk bed (twin on top, double on bottom). There is also a brand new double pull out couch in the living room which sleeps 2. So houseboat can comfortably sleep 7-8, sleeps max 9 people. The houseboat has one full bathroom. Kitchen is fully stocked with basic necessities during your stay (paper goods, plates, utensils, cleaning supplies, and cooking supplies). Kitchen includes microwave, dishwasher and sink with disposal. Boathouse was clean and well kept. Really close to the docks and Marina. Only complaint would be that the walk way is underwater when the tide is in. Made unloading and loading of your vehicles very difficult. An elevated ramp would make a huge difference. Houseboat was nice and clean and easy access from the parking lot (even though the river had the ramp to the houseboat flooded.). A TV and Wi-Fi would round out this place perfectly. Kitchen was well equipped for turning our yellow fin into poke bowls! We came to go fishing and have a place to stay. The house boat was very nice. We didn't sleep on the upper bunk beds because there were only 4 of us. The house had a lot of items that you would need when staying, paper towels, coffee, sugar etc. The house boat doesn't have a TV. When you are walking in the house boat it seems like you are walking down a small incline. While were there the porch would flood in the afternoons and you would have to walk through water. My husband put some pallets down so we could walk on them. Overall not a bad place to stay. Restaurant close by that was very good. The Houseboat leans to the back due to the weight of the ice machine sitting on the back deck. But as you say- it’s slight. Also, the river is very high right Now which causes the porch which is attached to the land to flood especially during heaving winds or high tide. This doesn’t not happen all the time however, only when the river is flooded as it is now. What a great place! Every thing you need and more! Great houseboat with plenty of room to sleep several adults and children. Very close proximity to the marina from our charter and watching the others come in. Will book again without A doubt! The houseboat is close to the marina so you can pull right up to it and off load. Be careful walking the plank between the ground and the houseboat if the water level is high. With the steep incline and wet conditions, it's slippery. The water was high during our stay making the houseboat higher than the ground. Plenty of coffee and filters along with various other supplies left over from previous campers. Also, plenty of mustard in the fridge so if you want mustard, you don't need to bring any. I found the water temperature in the shower to be very hot. There is a hot side and cold side. Also, the water pressure was strong. However, with the shower head in place, you could cut stone with it if you put the water on fully. No television so it was great to just unplug and talk to each other. Lauren, the owner, was in good communication and got back to me quickly. I would recommend this camp.